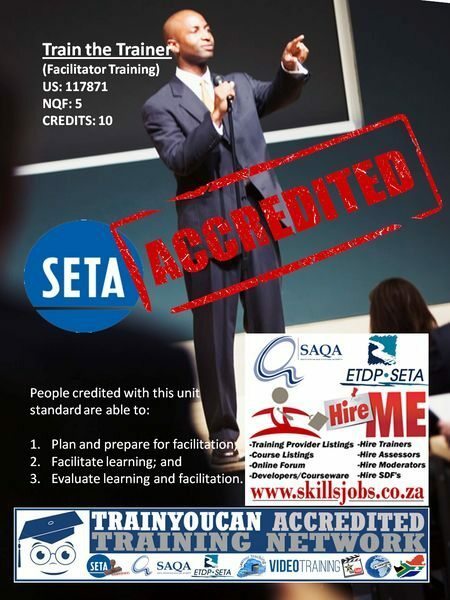 Currently there is no stipulation/guidelines on any SAQA policy to become a certified/accredited trainer, also knows as facilitator. The industry norm is that all trainers must have at least obtained an OBE or Outcome Based Education certificate in Adult Education and Training on a NQF level 5 or higher. 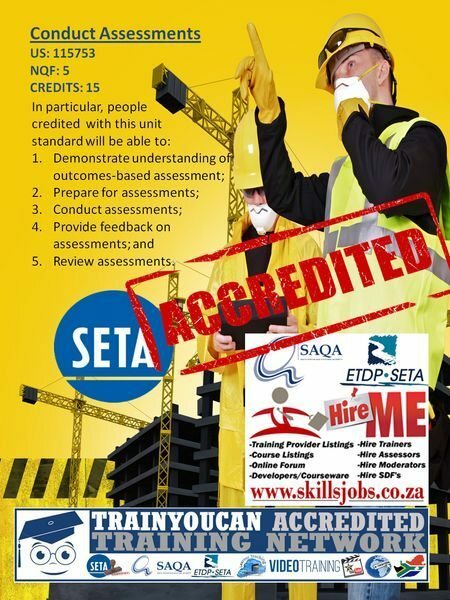 Currently the more acceptable choice or preferred will be unit standard 117871, previously 9957, also completed through the ETDP SETA - Education, Training and Development Practices Sector Education and Training Authority, that is ultimately responsible for Education and Training nationally in South Africa between the SETAs. During training the candidate must produce a portfolio of evidence and must be assessed as competent by the ETDP SETA - Education, Training and Development Practices Sector Education and Training Authority. This generic assessor unit standard is for those who assess people for their achievement of learning outcomes in terms of specified criteria using pre-designed assessment instruments, and will be able to conduct assessments within their fields of expertise. Any SOR - Statement of Results from anyone else is not valid, for example the SERVICES SETA. No SETA will accept Assessor Certificates, but instead a valid SOR (Valid printout from the SETAs database to confirm you appear in the system). 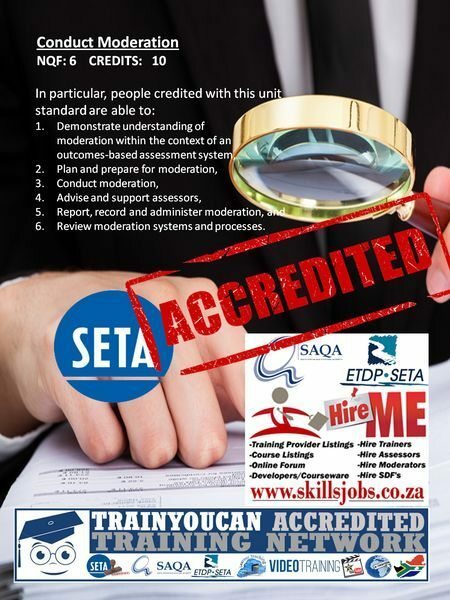 At this stage it only means the candidate is qualified as an Assessor and it does not give the newly qualified assessor the right to start assessing any learners on SAQA Unit Standards or Qualifications. The newly qualified assessor may continue with his/her studies and decide to qualify as a moderator. The candidate would then complete training on the moderator unit standard 115759 (previously 9929 or 7977) and would follow the exact same process as outlined above - certification by the ETDP SETA. This unit standard is intended to cover any situation in which moderation occurs, whether this be internally, i.e. within the ambit of the provider-assessor, or externally through cooperating providers, or externally through professional bodies and quality assurance bodies. Learners who completed any course with the TRAINYOUCAN Network can request for a copy of their SOR - Statement of Results or Certificate at no cost through our helpdesk. We do however require your full details to ensure we dealing with the correct person for verification purposes. Note that results are only uploaded on Feb + Aug each ear on the NRLD (SAQA) database.